The U.S. State Department has purchased for $400,000 a reproduction of that sculpture you see in the photo above, and will display it at the new U.S. Embassy that is now being constructed in Islamabad, Pakistan. Acquisition of “Camel Contemplating Needle” by John Baldessari. Includes production cost related to the procurement of representational artwork to be displayed at the new US Embassy Islamabad and reproduction rights. Representational artwork in embassies is intended for cross-cultural understanding through the visual arts, or something like that. So, what does that sculpture say about how the United States sees its relations with Pakistan? Is one of us the camel and the other the needle? John Baldessari's sculpture Camel (albino) Contemplating Needle highlights a confluence of belief from several different cultures. References to the camel and the needle appear in the Quran, Bible, and the Midrash [an ancient commentary on part of the Hebrew scriptures]. A life-size dromedary with its neck extended inquisitively eyes a super-sized needle in a way which makes the viewer think it could actually pass through the needle's eye. The colorless beast with striking blue eyes is simultaneously intriguing and peculiar especially when stripped of its pigment and fur. Interfaith dialog is extremely tricky ground for public diplomacy. In the first place, I don't think the camel-and-needle story means quite the same thing in its Koranic version (here) as it does in the New Testament. And, even if the Pakistanis interpret the sculpture in light of the biblical parable, surely they would see the United States in the role of the rich man who wouldn't give up his worldly goods in order to enter the Kingdom of God, and why do we want to send that message? Must we always do such abstruse artwork? Wouldn't something more accessible be a better choice, I mean, if the goal is actually to achieve cross-cultural understanding and not just to put out art for art's sake? The news media have obtained several minutes of security video from the Serena Hotel which shows the four attackers in yesterday's assault being screened and searched as they entered the hotel. They were patted down when they first entered the perimeter of the hotel grounds, then they were passed through a metal detector, after which they were patted down again. The video was first released by Ariana TV news a few hours ago. However, it seems to have since disappeared from their website. The physical pat-downs looked like they were performed competently, and included a search of the lower legs and ankle region. That would not have been enough to discover pistols concealed inside the shoes the four wore, so the big question remains whether or not the hotel's walk-through metal detector was working. Unfortunately, the video tells us nothing about that. After the attack on the Taverna du Liban last January, the diplomatic, NGO, and foreign journalist communities certainly would have reviewed the security measures at all of Kabul's foreigner-catering establishments. I assume they found the Serena Hotel's security acceptable, since it was heavily patronized by members of those same communities at the time of the attack yesterday. The latest attack was particularly brazen because it was considered one of the best-protected sites for civilians in Kabul. Sheltered behind a nondescript wall, entrants must pass through a security room at the gate where they are patted down and go through a metal detector as bags are put through an X-ray machine and sometimes searched. 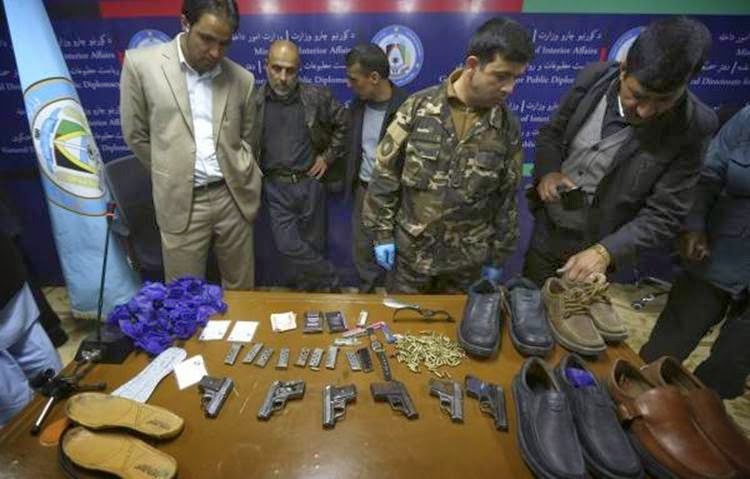 The attackers hid their small pistols and ammunition in their shoes and socks, Interior Ministry spokesman Sediq Sediqqi told reporters, but he could not say how the weapons went undetected. The hotel security has been known in the past not always to act when the metal detector beeps. Based on my own experience over a lot of years and in a lot of places, it is pretty typical for security screeners not to act when the metal detector beeps. That's a human problem brought on by doing a mind-numbing routine for long hours at a time, often made worse by the technical problem of an uncalibrated metal detector (maybe the detector nuisance-alarmed on everything? maybe the guards turned the sensitivity down until it didn't alarm at all? either way, it was ignored), both of which are wrapped up in the cultural problem of low-wage, low-status, guards who are supposed to search the wealthy and powerful patrons of an elite establishment. In a social and psychological sense - and probably literally, as well - a guard at the Serena Hotel uses the servant's entrance. It is unrealistic to expect him to be willing to jack up a local or foreign big-shot just because a metal detector beeps. Guard orders notwithstanding, he knows better than to do that. Still, it's remarkable that the four attackers were able to bring in six pistols plus what I'd guess was upwards of 200 rounds of ammunition, all of it reportedly hidden in their shoes. The attackers were armed only with six tiny handguns, barely bigger than cigarette packets, but shooting went on for over two hours as security forces hunted down the last attacker, who hid inside toilets at the sprawling hotel complex. Hundreds of staff and guests took refuge in a cavernous bunker, while others were evacuated from the building. The last person rescued, [MOI Spokesman] Sediqqi said, was the gunmen's first target. A senator who had been dining with three other legislators hurled glasses at the young attackers and escaped into a nearby garden where he hid for four hours, injured but alive. The other three all survived the attack unharmed. The Serena had been one of the few places in Afghanistan where both foreigners and the country's elite could relax and enjoy rare luxuries such as a swimming pool and 24-hour electricity. Tight layers of security including armed guards, multiple steel gates, metal detectors and x-ray machines made the five-star hotel feel safe even though it had been hit by an attack in 2008 that killed seven people. Thursday's attackers apparently hid handguns and bullets, wrapped in blue tissue paper and hidden under in [sic] the soles of their chunky shoes. 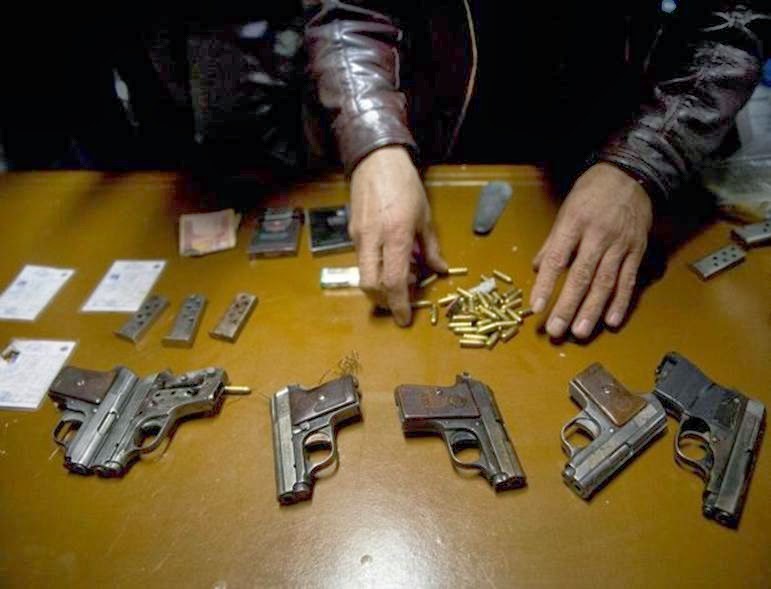 They had told guards on the door that they were going to the restaurant for dinner, the interior ministry spokesman said, although the government is investigating why their guns were not discovered during security checks. Smuggling guns through the hotel's security screening was a bold tactic. Was it really that simple? After looking at all the publicly available photos, I'd say the pistols were .25 caliber, or the Russian 6.35×16mm semi-rimless cartridge equivalent. They look comparable to the old 'Baby Browning' pistol, and indeed could be an arms bazaar knock-off of the Browning. That would put their dimensions at about 4 inches long by almost 3 inches high, and less than one inch wide. Their weight would be under ten ounces. I count six pistols that were shown to the press, along with nine ammo magazines and a pile of up to maybe 100 loose rounds. If the shooting went on for four hours, and there were that many unexpended rounds left after it was over, how many rounds did the attackers bring in? Those shoes look big, but are they that big? Did four men really carry in all that material hidden in their shoes? I can believe the shoe-smuggling technique would work, but I suspect there was more to it than that. Such as another security failure, perhaps one that can't be easily blamed on the guards in the screening room. Maybe we'll find out more after an investigation. Whether we do or not, I think we can assume the foreign communities in Kabul will now be more locked-down than ever before as Afghanistan approaches the Presidential election two weeks from now. Sen. McCain advising a young Swift Boat Captain? U.S. Secretary of State John Kerry had six hours of talks Friday with Russian Foreign Minister Sergey Lavrov about the impending vote of the Crimean Peninsula to secede from Ukraine. See US, West Brace For Crimea Vote To Leave Ukraine. U.S. Sen. John McCain, in Kiev on Friday, pledged to help send an array of armaments, ranging from combat infantry rifles to anti-tank weapons, to Ukraine as quickly as possible. Ukraine's military is largely poorly trained, but McCain pointed to the looming Russian troops as enough reason to help the country defend itself. "Would you like them to throw rocks?" said McCain, a hawkish Republican from Arizona. "If that's what they're literally begging for, why should we judge whether we give it to them or not?" I had never before today seen Senator McCain as a postmodernist thinker, but he asks a very postmodern question. What right do we - the United States government - have to judge anyone or anything? In a world without moral certainty, what is there to think about before entering into the conflict between Ukraine and Russia, or any conflict anywhere, if that's what you feel like doing? Really, who among us would be so judgy as to criticize what some other party wants? To cast the first stone, as it were? At first, I thought McCain might be alluding to Hamlet's speech about indecisiveness - "thus conscience does make cowards of us all" - as a way to criticize the overly analytical SecState Kerry. But then I realized where I'd heard it before. I realized ... like I was shot ... like I was shot with a diamond ... a diamond bullet right through my forehead. 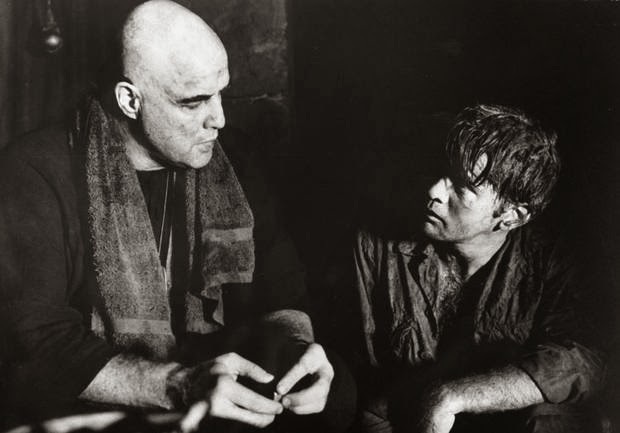 It came out of Colonel Kurtz's monologue from Apocalypse Now! 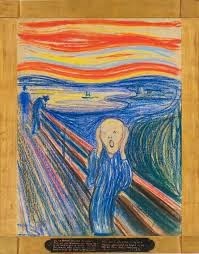 Fast-forward to the 5 minute mark for the key part of Kurtz's monologue. Or just enjoy the whole freaky thing. I won't judge. Will John Kerry Do For Barn Coats What Hillary Did For Pantsuits? Actually, I'm not sure whether or not Hillary Clinton made the pantsuit popular with senior executives at the State Department or elsewhere. But I do know that our current SecState is my sartorial role model due to his frequent wear of the classic New England barn coat. Do yourselves a favor this winter, gentlemen. Lose the stodgy wool topcoat and get a practical and stylishly masculine barn coat. Go ahead, wear it to the office on snowy days. You know you want to. It will work over a suit and tie, as John Kerry has shown on many occasions. It works even better for business casual. With khakis, it is perfect for TDYs. A word of caution: unless you're Prince Charles, don't do the Barbour-style English waxed cotton jacket. They seem to be gaining acceptance among Americans as alternatives to raincoats, but they don't work in cold weather. Forget the country squire look, and go the full LL Bean: heavy canvas fabric, corduroy collar, big patch pockets, and a wool lining. For extra utility, a game pouch. You'll thank me. Or Kerry. The outside air temperature is 23 degrees as I write this, at 7 PM Monday, but it will drop into the single digits overnight. My particular just-outside-the-Beltway neighborhood is forecast to hit zero degrees at 6 AM. 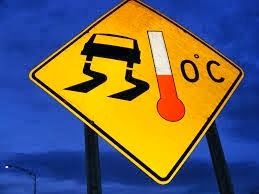 Given the certainty of hazardous driving conditions tomorrow, I predict a greater than 50 percent likelihood that the Office of Personnel Management will announce a delayed opening and unscheduled leave for government offices in Washington. 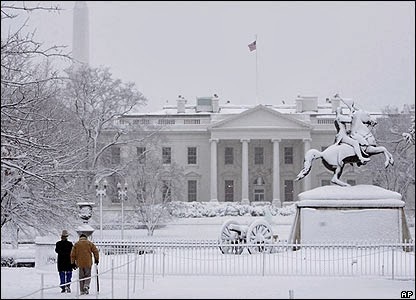 I put the likelihood of a government closure at no more than 10 percent, currently. But that would go up if area metro systems have any weather-related shutdowns - always a possibility - or if highway departments ask OPM to help alleviate traffic problems. For me, the upside of these cold weather work days is that I can ditch the usual business clothes and go to the office in hiking boots and a manly barn coat. Makes it all worthwhile. 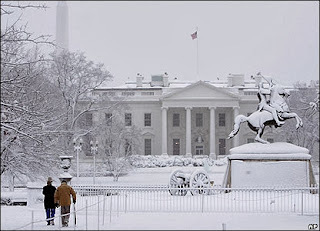 This one was an easy call for OPM: FEDERAL OFFICES in the Washington, DC, area are CLOSED tomorrow. The normal practice for OPM is to wait until about 4 AM on the day of before making an announcement, but they announced tomorrow's closure at 7 PM tonight. With a forecast of freezing rain tonight, followed by 5 to 9 inches of snow tomorrow, and temperatures going down to the tens or maybe even single digits on Monday to keep it all frozen well into Tuesday morning, there was no suspense about what OPM would decide. The roads will be particularly bad tomorrow, since today's rain will have prevented highway departments from pretreating surfaces with de-icing salt. A bonus for me is that my BlackBerry died Friday night, which means that I haven't seen any of my office e-mail for two whole days. Now, I won't see any for maybe another two whole days.